How to draw using colored pencils. Colored pencil art. What coloured pencils should I buy? With colored pencils the old adage definitely proves true. You do get what you pay for. Pencils can be just a few dollars for a whole tin or over $5 for a single pencil. It is far, far better to have a few good quality pencils than to have 200 cheap ones. Why? Cheap pencils contain less pigment and are made with cheap ingredients. This means that colors will not be so vibrant nor cover the paper so well. Using a nasty, scratchy, wishy washy pencil could put you off working with pencils forever or make you think that you are just no good at it. Even the most amazing artists will struggle with poor quality pencils. All good quality pencils are available to buy as open stock items, which means that you can buy just a few colours and buy more as you can afford them. Or buy a small tin, but remember when making your first purchase to think about the subjects that you want to draw. A tin of neon brights will be useless if you want to draw landscapes, a box full of greens a waste of money if you want to draw portraits. I began with loose pencils simply because I could choose the exact colours that would be most useful to me and gradually added colours according to their usefulness to me. I cannot stress enough the difference that using a high quality pencil makes to both the ease of working and the finished result. I personally use five brands of pencil these are some of the best professional colored pencils you can buy. Faber Castell Polychromos, Caran D'Ache Luminance, Caran D'Ache Supracolors, Caran D'Ache Pablos and l recently bought a full set of Prismacolor Premieres to try as so many artists start out with these. If I could have only one set of pencils, it would be these. They are an oil based pencil, all but two colours (Light Magenta and Manganese Violet) in the range of 120 colours have good lightfast ratings. Why this is important is discussed below. The colour range is excellent. The lay down of colour is beautiful and smooth. Being oil based there can be no wax build up. They have a harder lead than wax based pencils and can be sharpened to the finest point which does not break. The leads are bonded to the wood casing, so if you should happen to drop and break a lead it will only loosen at the place fractured. The pencil will still be useable, unlike poor quality pencils which are not bonded. If you drop those the whole lead will slip out of the case and render the pencil useless. I have never had a Polychromos lead break. The colours can be rich and vibrant or used as a glaze. They are beautiful all round pencils. Except for the white pencil, which is all but useless. If you buy Polychromos, purchase a white Luminance or Supracolor or Derwent Drawing Chinese White to use in conjunction with them. The Derwent Drawing Chinese White is quite thick and waxy, it is very difficult to get fine detail with it, and it does not hold a point very well, but it does cover pretty well, so it is nice to have. The Rolls Royce of coloured pencils. They are expensive, but, yes, they are worth it. These are a wax based pencil, but unlike Prismacolor I have never, not ever, had wax build up or bloom with these. The colour lay down is smooth and creamy. They are more opaque than Polychromos. The lead is slightly thicker and does not hold its point quite as well as Polychromos, so it is a little more difficult to get superfine detail. The colour range is more limited. However, there are some beautiful and unusual colours in this range that are not available in Polychromos, especially the paler ones. The white in this range is one of the best that there is. All the colours are lightfast and they work really well in conjunction with the Polychromos. I really would not like to be without these pencils and use both these and the Polychromos in every piece of work I create. This is the only other brand of pencil that I use. Technically they are watercolour pencils, I never use them with water. I blend them along with my other pencils using odourless mineral spirits. The range does not have as good lightfast ratings as the Luminance pencils, so you need to watch for that, but it does have some incredible and unusual colors. The pencils themselves sharpen to a very fine point, which holds fairly well. They are better for fine detail than the Luminance. I really like these pencils. I particularly love the white, often the only white that will show up over many layers, and again I use these in every single piece of work that I do. I find that they cover extremely well and the lay down is very smooth. Like the other two brands I use there is never a problem with wax bloom. Caran D'Ache Pablos are a more recent addition to my collection. They have the exact same color range as the Supracolor pencils. 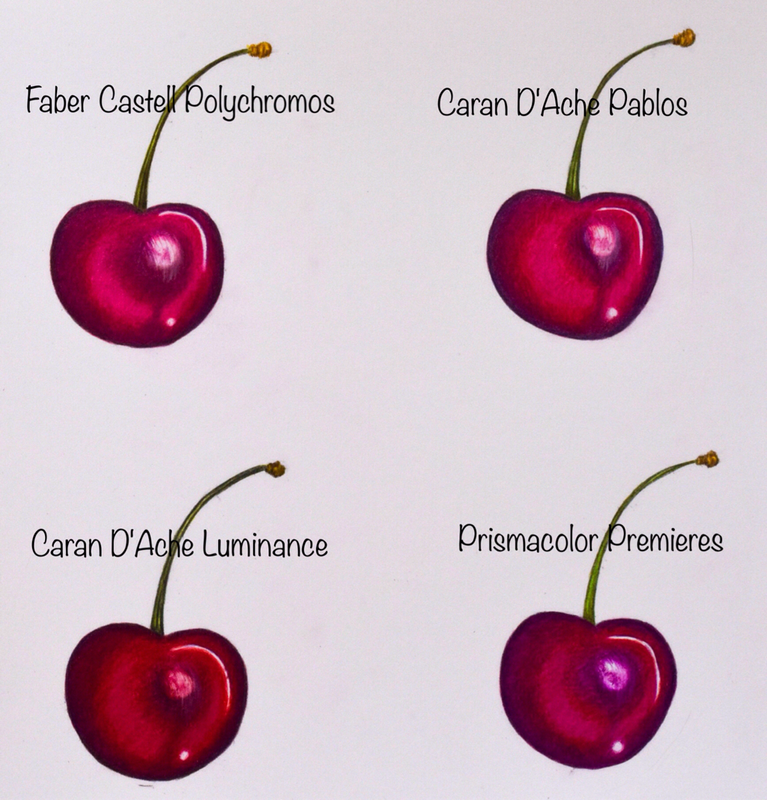 But several artists have mentioned how good they are to use in conjunction with Polychromos, so l wanted to try them. The first thing l noticed was how beautifully smooth the lay down of these pencils was. They are creamy and soft, yet the lead is hard enough to hold a good point. The point does not hold quite as well as Polychromos, but good enough to get fine detail. They do work beautifully with the Polychromos. They also blend amazingly used alone (see my yellow Gem blog post for a piece worked with only Pablos). Personally l like them better than both the Luminance and the Supracolor. They are more expensive than Polychromos. These are my most recent addition, bought mainly to see what they are like and because so many artists begin with them. They are by far the cheapest of the pencils that l use and they have the worst light fast ratings. A third of the 150 colors are not lightfast. But they are probably the most accessible and certainly the most affordable of the artist grade pencils. They have problems, they are hard to sharpen, my Carl Angel 5 works beautifully on them, but my manual sharpener can eat half a pencil as the point just breaks off repeatedly. The core breaks very easily and it is not bonded to the wood, so if a core breaks unless you are prepared to try microwaving tips etc that you might find on the net, you have lost your pencil. They are very soft and wear down fast. They do not hold a point. They suffer badly from wax build up and nasty little balls of color lift from your paper. On the good side in the early stages they blend nicely. They are the softest and creamiest of all the brands that l use. But it becomes hard to add more layers very quickly and you need to use methods to remove some surface before you can continue layering. They are terrible for fine detail. They have some nice colors and a good range. If money is tight and you really can't stretch to a few Polychromos these are an option. I am happy to use them in conjunction with my other pencils, l am not sure l would like these to be my only pencils. I would rather have a few of any of the above than all 150 of these. But some of the most amazing coloured pencil artists in the world use them, so the issues with them can certainly be worked around. Holbeins are expensive pencils but are considered some of the best in the world. I recently bought a full set. They are a very interestingly textured pencil. The thing l actually like best about them is the amazing range of pastel shades which are just not available in the other brands that l use. It is so good to have these colors. Kingfisher using these alone if you want an idea of the results from just this set of pencils. They sharpen well. The pigment is vibrant. They don’t leave dust. I had no breakage. I have really only one con for this pencil, but it is a huge con for me. They are not available open stock. I have searched the net and the one place that did once supply online to the USA no longer does. This means purchasing a set every time you need to replace one color. Very, very expensive. Particularly as one of my favorite colors is only available in sets of 50 or more! I really want to add this piece on Schpirerrfarben pencils. I was actually sent these to try (after telling the lovely lady who offered to send them not to send them unless she really believed in the quality of the pencil because there was no way l could ever say they were good if they were not! I honestly thought I would never hear from her again! ). They are not currently lightfast tested. This is an issue, but it also needs to be remembered that all of the above brands are light fast tested but not all the individual colors in those brands pass the test. All but Caran Dache Luminance have some colors that have no lightfast rating or a one star one. Prismacolors in particular have many colors that do not get a rating and it is very hard to know which colors these are because they do not have a rating on the pencil. I personally hope that these pencils will be tested at some point. They are a very, very affordable pencil. They feel very like Prismacolors to use, very soft and creamy, but they don’t wear down so fast. They hold a point much better than Prismacolors so they are much better for fine detail. They are an oil based pencil so no wax build up. They sharpen beautifully, l had no breakages. The best thing about them is the vibrancy of the color. They blend beautifully. They are made in China, it doesn’t say so on the tin, but they are. The things that l wish l could change on these pencils are that the color of the paints on the barrels often in no way reflect the color of the core. Which makes it more difficult at times to pick out the color l want. I would love to see more colors, especially pale shades and greys. But l would love more colors in every brand so l can’t really single this one out for that. As always it depends what you draw. Some people have said there are not enough browns, l don’t use much brown so it doesn’t worry me. The colors of sets are therefore always more suitable to some artists than others. As l said right at the start of this article you have to think about what you personally will want to draw. Having said that l found the colors mix easily to create new ones and although lacking in pale colors the white in this brand is pretty good and a layer of white put down first often gives the required result. l have two blog posts on these pencils as l type , and will probably be adding at least one more. If you check those out you can see the results. What l would say is that anyone who wants to try the medium or any hobby artist wanting to add to their collection can’t really go wrong with a set of these. When you think that some of the brands l use are ten times the price you have really great value.